Favorite TV Show: Gilligan's Island. Why yes, I do own all three seasons on DVD, and the Professor may or may not have been my first crush. Favorite Vegetable: Bok choy, baby! If you've never eaten this stir-fried and accompanied by rice, you should! Favorite Drink: Air Soya--I'm not sure if this is soy milk or soy water or soy juice, anyone know? Okay, I know you can't tell which one is the mom because we all look like sisters (haven't heard that one a million times...) so she's the one in blueish-black. And she's quite awesome, which is why she's my favorite mom. 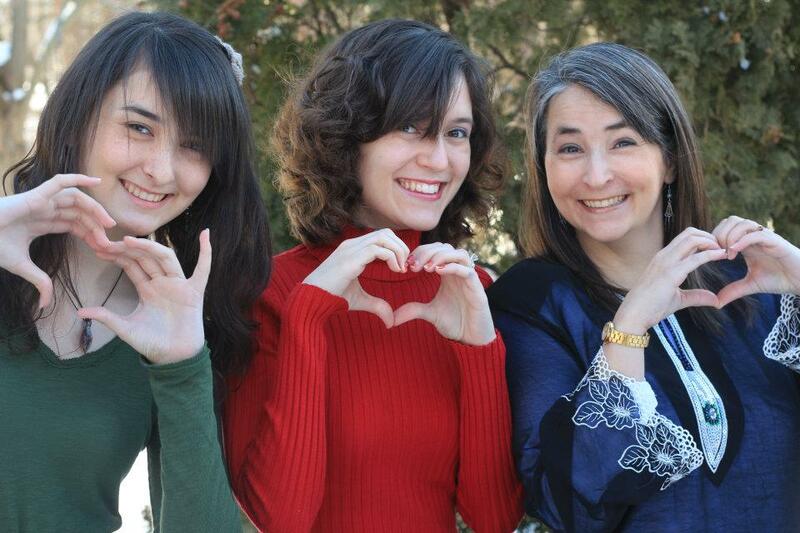 And we are posing as if we were going to be on the cover of a Korean drama, which explains the hearts. I don't think this one requires any explanation. This was taken at our engagement party--I've always loved it, inexplicably, perhaps. That's such a cute picture of you with your mom and sister! Ha ha. Favorite pirate, love it. I agree bok choy is yum. That's a great picture of you with your mom and sister. The video is what makes that song so much sadder! Wow your mom really DOES look like your sister! And Jack Sparrow is my favorite version of Johnny Depp. I love (and am jealous) that you have a notebook of him. Oh my goodness, when I was in middle school (or late in elementary?) they started showing Gilligan's Island on Nick at Nite. I was in this phase where all of a sudden my older sister had friends and I didn't yet, so she didn't hang out with me, but she stayed up all night on AIM. ANYWAY she'd be typing away at the computer and I'd watch Gilligan all. night. I think she hated me for it, but I looooved it. Also, I once accidentally bought bok choy thinking it was lettuce. Gilligan's island is the greatest! High fives for you! You have a gorgeous family! And Gilligan's Island just reminds me of my childhood. Oh TV Land, how I loved you. ha ha ha... I love that gangster photo of you and Angel that is wonderful! I think that it's really hilarious you watch gilligans island. I have never seen an episode. Movie marathon? deal! Also Korean Drama! ha ha! Your family kills me. OMG I loooove Gilligan's Island! I haven't seen it in so long!